If there ever was a face that you could say – without hesitation – the camera loved, it is the divine face of Louise Brooks (1). After leaving Hollywood in 1928, Brooks went to Germany and was cast by director G.W. 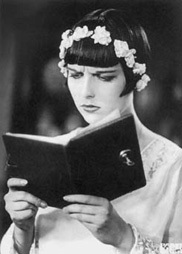 Pabst as Lulu in the classic German silent film Pandora’s Box (1929). Brooks’ unique look and style was brilliantly captured on film by Pabst, and Pandora’s Box cemented her screen persona and forever enshrined her in the annals of cinema history. Her iconic bobbed hairstyle, sexual confidence and defiant attitude imprinted itself on generations of cinephiles who also made films featuring strong, independent women, from Anna Karina in Jean-Luc Godard’s Vivre sa vie (1962) and Melanie Griffith in Jonathan Demme’s Something Wild (1986), to Uma Thurman in Quentin Tarantino’s Pulp Fiction (1994). Brooks is principally known for her role in Pandora’s Box, but what many people may not know is that she quickly re-teamed with Pabst for this follow-up, the only other film they made together (2). In Diary of a Lost Girl, Brooks plays Thymiane Henning, the innocent young daughter of a pharmacist (Josef Rovensky), who is seduced by her father’s lecherous assistant, Meinert (Fritz Rasp) and later gives birth to an illegitimate child. Reading Thymiane’s diary, her family discovers that Meinhert is the baby’s father, but neither Thymiane nor Meinhert want to marry each other. Thymiane is forced to leave her home, give her baby away to a midwife and is then sent to a strict girl’s reform school, where the school’s Director (Andrews Engelmann) and his wife (Valeska Gert) subject the girls to relentless, regimented, military-like discipline. Thymiane fights back against this oppressive regime and escapes from the school with her friend Erika (Edith Meinhard). Discovering that her baby has died, Thymiane wanders the streets in despair, until she eventually tracks down Erika, who is working in a brothel. Thymiane also ends up working at the brothel, where she begins to rebuild her life and regain her self-esteem. As in Pandora’s Box, Brooks plays an outcast, but when the film begins, Thymiane is a world away from Pandora’s Lulu. Whereas Lulu had men eating out of her hand, Thymiane is an innocent cast adrift in a hostile world. Thymiane is less in control of the men around her and much more dependent on them than they are on her. After enduring many hardships in the first half of the film, the second half sees Thymiane gain the strength to reassert herself and take back control of her life. It is here that the character of Thymiane is transformed into the Brooks we’re familiar with from Pandora’s Box: the confident, vivacious woman who lives life to the full, and does so on her own terms. Once re-established in society, Thymiane enters a life of wealth and privilege, and uses her status to help those who are suffering as she suffered. In contrast to the closing moments of Pandora’s Box, where Lulu comes to a tragic end, Thymiane stands defiantly against those who would try to persecute her or crush her spirit. The “lost girl” of the film’s beginning becomes a woman who finds herself. The film is as much about the social conditions that Thymiane lives in and the world that she sees around her as it is about Thymiane herself. Much of Diary of a Lost Girl is shot in a more realistic style than the expressionism of Pandora’s Box – although, as Tom Milne points out, Pabst uses both styles in Diary of a Lost Girl, with the opening sequences in the pharmacy presented in the manner of social-realism, and the scenes in the reform school utilising expressionist camera angles and acting techniques (3). Diary of a Lost Girl is a compelling indictment of the society of the time and while the majority of the film successfully conveys this visually, some of this is conveyed in some rather heavy-handed moralising towards the film’s end. However, Pabst’s directorial skill is evident throughout Diary of a Lost Girl: his close-ups and his staging of the action draw the viewer into the drama, and make them identify with Thymiane throughout. This is particularly evident in the extraordinary café sequence, where Thymiane and her father – who have not seen each other in some time – exchange long, sad looks across a crowded room. With Pabst’s strong direction and Brooks’ subtle yet expressive performance, Diary of a Lost Girl is much more than a footnote in the careers of its gifted director and his remarkable leading lady, and definitely warrants a reappraisal. Useful web-based recourses on Louise Brooks include: Tina Marie Camilleri, “Cinema and the Female Star: Louise Brooks” Senses of Cinema no. 23, September–October 2002, and “Louise Brooks Society”, a website featuring news, a biography, filmography, links and an online archive. Also of note is Brooks’ own account of her life published as Lulu in Hollywood, Knopf, New York, 1982. The version viewed in the preparation for this article runs approximately 80 minutes, considerably shorter than the restored version that will be screening in the Cinémathèque’s season. Tom Milne, “Diary of a Lost Girl”, Monthly Film Bulletin, December 1982.